The Perfect Gift for Mother’s Day. Mother’s Day is almost here, and we recognize that the pressure is on to find just the perfect gift. Whether it’s your Mom or the Mom of your children, we know this is someone special who has dedicated countless hours to the happiness and health of your family. Honoring those efforts is no small task. 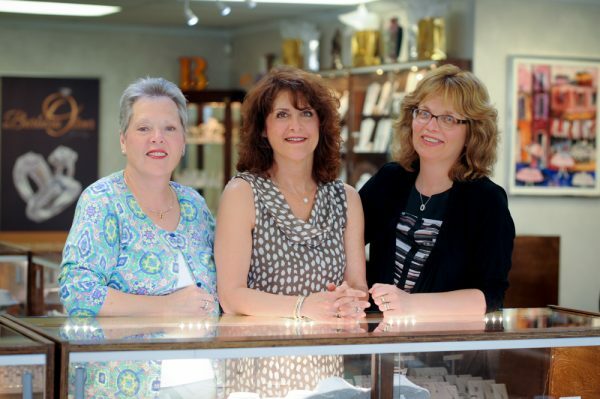 At Barbara Oliver Jewelry, we’re here to help you commemorate the Moms in your life with something special. We have something for everyone. You can spend a little or a lot. Fine jewelry doesn’t necessarily mean expensive. We have something for everyone’s comfort zone. Selecting the right piece can be fun and rewarding. When you visit our shop, we’ll ask you to make yourself at home and browse around. We promise we won’t hover. If you’d like help in selecting something, we’ll be happy to assist. We’ll ask you about your Mom. . . Does she prefer necklaces, rings or earrings? Is she artistic? How does she spend her days? This will give us an idea of her style and taste. If you show us a picture of your Mom, we’ll be delighted. We like to see who we are helping decorate. If you already know exactly what she wants, that’s fantastic. We’ll point you in the right direction to a perfect array of choices. After you find that something special, we’ll be happy to wrap it up for you complete with a bow, so you’ll be all set for the big day. We like to think out-of-the-box (pun intended). A mother’s ring is great, but it’s not for everybody. Take a look at some necklace and pendant suggestions we came up with below. Looking for something else? We have over a 2,000 pieces in our shop. Feel free to stop in and take a look. For the classic Mom who likes something a bit different. 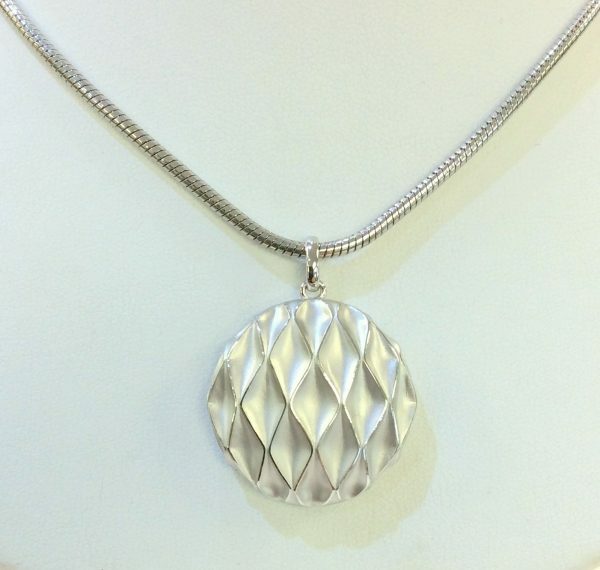 The clean lines in this stunning silver pendant make for a perfect summer piece that goes anywhere. Wear it with shorts to a picnic or a summer dress out for dinner. 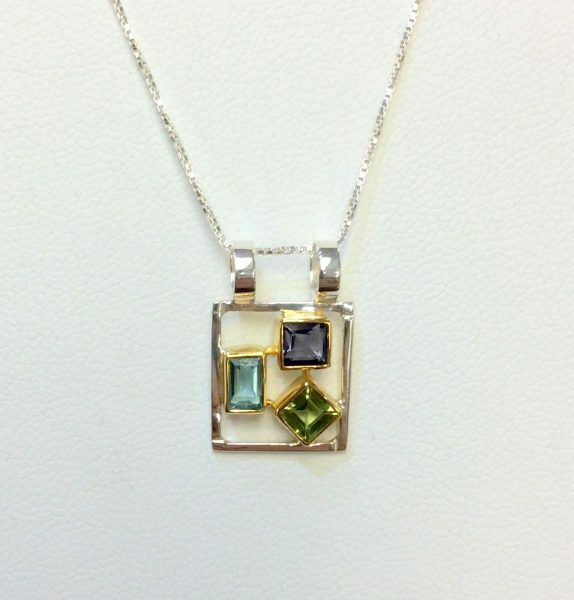 This multi-colored gemstone pendant features iolite, peridot, and amethyst in a sterling silver setting. This light and airy piece says summer fun all the way. Perfect for the creative Mom who enjoys a bit of color. 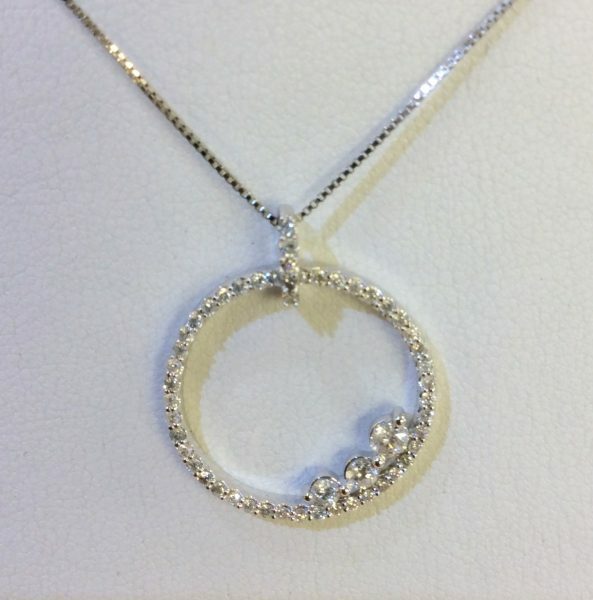 This diamond pendant with graduated inset stones offers an eye-catching variation on the classic circle. Set in white gold it features a total weight of ½ carat of in diamonds to say “I love you!” Diamonds are a wonderful gemstone for any special occasion. Read more in our Blog: “All About Diamonds — April’s Birthstone”. 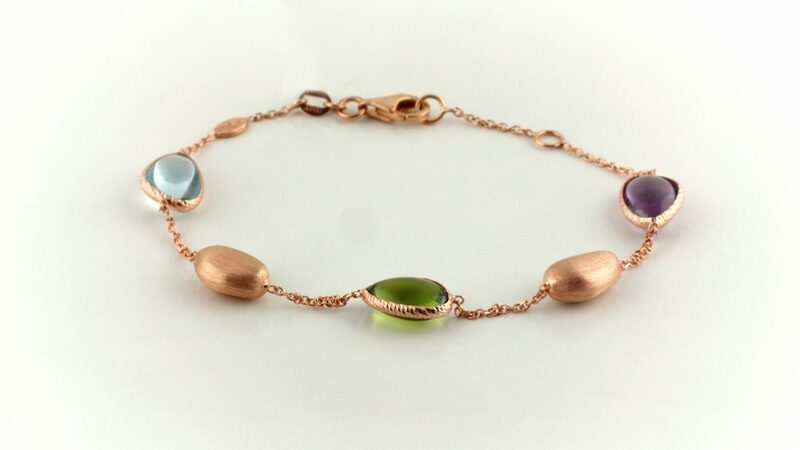 Emerald is May’s birthstone and we think perfect for Mother’s Day too. 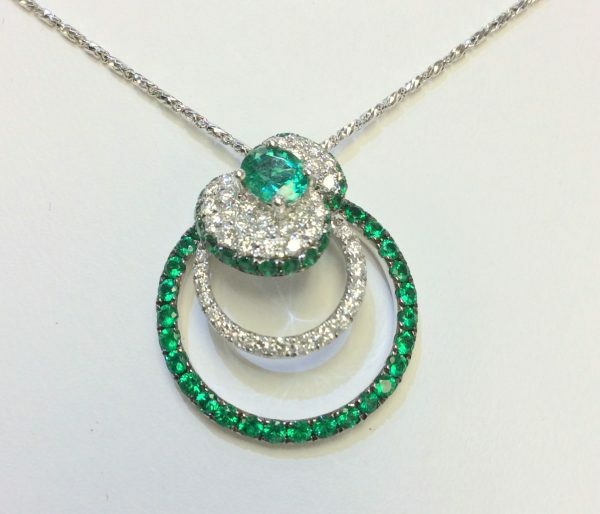 Swirls of diamonds and emeralds pendant make for an enchanting pendant that will always be remembered. 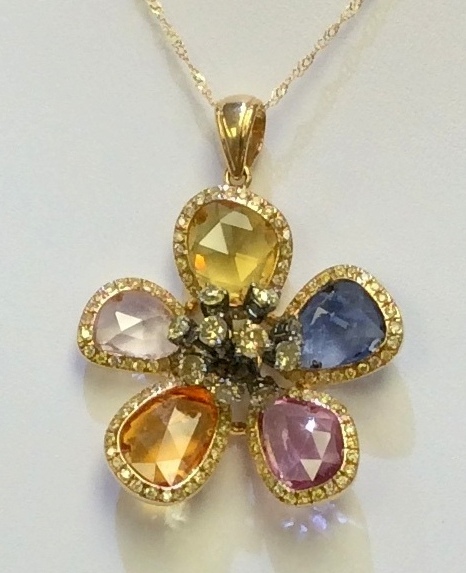 Colored sapphires and diamonds combine to make this beautiful and easy-to-care for flower. No watering or pruning needed! The perfect necklace for a flower loving Mom. A stunning piece set in 18K yellow gold with over 10.5 carats in sapphires. If you are in the Buffalo, NY area, please stop by our shop at 5820 Main St. in Williamsville. We’d love to meet you and help you find just that right piece for Mother’s Day or any day.